Thanksgiving is just around the corner. I don't know about you, but I am already busy planning our Thanksgiving meal. The whole household is excited because it is the first year that all of my husband's side of the family is coming to our house to celebrate. I am really looking forward to it and trying not to stress about everything being "perfect". I am happily finalizing menus and figuring out who should bring what. I think it will be fun. One thing I am sure of is how we are preparing the turkey. It's going to be fried, but not with just any fryer. We've wanted a turkey fryer for ages, but the waste and expense of gallons upon gallons of oil was a big turn off. Not to mention that much oil cannot be good for you. 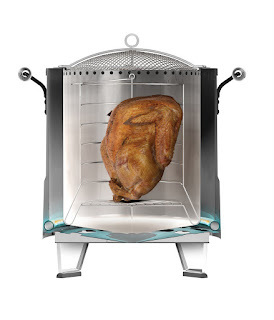 So, this year we will be using the Big Easy by Char-Broil, an infrared oil less turkey fryer. How cool is that? Thanks to the great folks at Hammacher Schlemmer, we were given the opportunity to review this awesome product. Check out my video review below. Please excuse me trying not to laugh there at the end, I could hear our Bullmastiff panting behind me and I was struggling to keep my composure. She wanted to eat too! To be quite honest, I was very impressed with this product, which came as a surprise. I did not expect it to perform as well as it did. I had serious doubts that it would produce anything that tasted remotely close to being fried. I was so pleased to be wrong! The instructions for assembly as well as use are quite clear and easy to understand. The fryer does actually produce fried food without the greasy mess of gallons of oil. This is better health wise, as well as more economical. You can pick up one for yourself at Hammacher.com. We are thrilled with ours and will be using it every chance we get. Ramblings of a Texas Housewife Product Review and/or Giveaway Disclosure- I have received no compensation from Hammacher Schlemmer other than the offer of free product to review and/or giveaway. Any opinions expressed on Ramblings of a Texas Housewife are my own. My reviews are never reviewed or edited in any way by sponsors. I've never heard of an oil-less turkey fryer! That would be awesome to have for Thanksgiving. I love fried turkey but it's just so much of a hassle to cook and clean. Thanks for sharing! Very impressive! What a great idea, I love the no greasy mess and the fact that it's healthier for you than actually frying it. You've sold me! I would love one!